Imagine you are given one simple task: arrange the seeds of a sunflower so that they maximise available surface area. How would you even begin to tackle this puzzle? You realise that there is an important condition that needs to be met; the sunflower has to be able to produce this pattern using its already existing biological processes. The plant has to be able to replicate your solution! 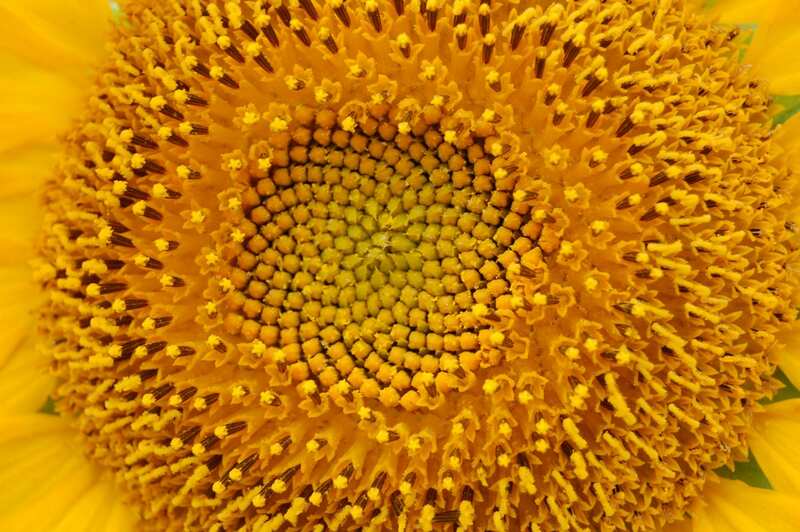 This problem is actually quite complex so let’s cheat a little and examine the spiral patterns formed by seeds found on other sunflowers. Upon close inspection, we observe that the number of clockwise and anti-clockwise spirals are usually 34 and 55 respectively. Click on this link if you’re having a hard time visualising it. In larger sunflowers, they can be 55 and 89 or even 89 and 144! Fun fact: the tallest sunflower ever grown was measured 9.17 m.
You might be familiar with those particular numbers if you’ve heard of the Fibonacci numbers. It’s a famous mathematical sequence where each number in the sequence is the sum of the two previous numbers. If we start at 1, the sequence goes like this: 1, 1, 2, 3, 5, 8, 13, 21, 34, 55, 89, 144, 233, 377 and so on. While it may seem like an arbitrarily defined sequence of numbers, the Fibonacci sequence is actually quite mathematically complex, and, as we’ve seen with the sunflower, found all throughout nature. Could you have figured out that the answer is to use Fibonacci numbers? The sunflower found this solution all on its own, taking consecutive numbers in the Fibonacci sequence as the number of spirals in each direction. What’s more is the spirals are separated by an angle of 137.5 degrees, known as the golden angle. Considering its evolutionary history, I’m going to say that the plants figured this one out long before humans did! Of course, the sunflower developed this particular pattern of spirals due to evolutionary processes, not because it has any mathematical ability (duh). The idea is that sunflowers with the most seeds packed onto its surface area were more likely to reproduce, or, dare I say, multiply. It just so happens that the most efficient way of doing so shares the same pattern as the Fibonacci sequence. However, not all sunflowers get it right with 1 in 5 flowers having the incorrect number of spirals. Plants obeying the laws of mathematics extend far beyond the sunflower. Pictured above is a little-known, peculiar looking plant known as a Romanesco cauliflower. The little protrusions are sometimes called fractals because of their similarity to mathematical fractals. Fractals are structures that can be zoomed in infinitely and still retain some form of symmetry. Most of these look like something that would appear in a psychedelic experience (who says mathematicians don’t have fun?). 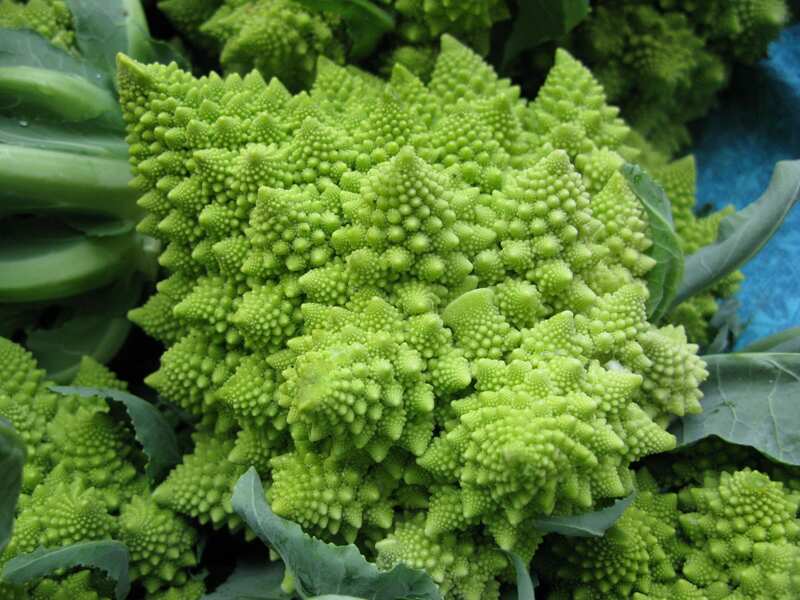 If you don’t believe me check out a Google image search for fractals. Isn’t it absolutely stunning to find complex mathematical patterns (which humans invented/discovered) in nature? While there are many, many more beautiful examples of maths in nature that I could share, no number of blog posts could cover them all. Sometimes, it just takes a closer look at nature’s creations to find familiar patterns. Thanks Owen. It’s certainly cool that maths is not just found in plants but almost everywhere you look! Interesting article! its great to see where maths come into play in nature. Your pictures are an excellent representation of the whole article. I felt like I got the main point just by reading the title and looking at the pictures. Very well done! Thanks Tyler, glad you found it interesting. Thanks for the kind words Isabelle! It certainly is fascinating to think that non-sentient beings can ‘do maths’. Thanks Jing! I believe the golden angle is closely related to the Fibonacci sequence. Sometimes we create maths to describe things in nature, but in this case, I think we started observing all these patterns once Fibonacci came along. The sunflowers exhibit this pattern because it is the most efficient way to arrange the seeds. Over millions of years of evolution, the sunflowers with the most seeds reproduced most successfully, meaning new generations fo sunflowers had this trait. I agree that most people don’t realise how universal mathematics is. Fractals are amazing (I’ve got about 5 wallpapers of them on my laptop). Glad you enjoyed! I first learnt about the Romanesco cauliflower while researching the sunflower. It really is interesting! Thanks Natasha, glad you appreciate my sense of humour! Nature is amazing, and so is your article. Never thought that plants would ‘know’ how to do maths! It’s such a fun read! I knew about the golden angle in sunflower seeds but not the Fibonacci sequence part. I was wondering if the discovery of the Fibonacci sequence has anything to do with observing the nature? Or is it just pure coincidence that the sequence applies on the seeds? Honestly think its so crazy how much maths is in nature. Like, it makes sense if you think about how much maths governs things like physics and things like thermodynamics, but people hardly relate it to something like flowers. I remember learning about how prevalent the Fibbonachi sequence is in nature many years ago, and it just astounded me how many things follow it. My favourite example has to be the snail shell! And don’t get me started about fractals haha, something which seems so complex yet here we have plants that resemble these crazy patterns just because that’s how they have evolved. Really love the topic of this post. Fascinating that plants can reproduce complex mathematics, especially with the Romanesco cauliflower I’ve never seen that before! Great use of links for anyone who wants to take a more detailed look at the topic! This was really interesting, it’s funny to think that we claim mathematical discoveries when in reality nature has figured them out long before we do. I really liked your subtle use of humour, it made for a really engaging read!